I absolutely loved hanging out at Gen Con. This was my first year going and I was not disappointed. Saturday morning we decided to hit a couple small publishers and see what they had to offer. One of the great things about just walking around is you find the games that people pour their sweat and tears into trying to bring their games to life. 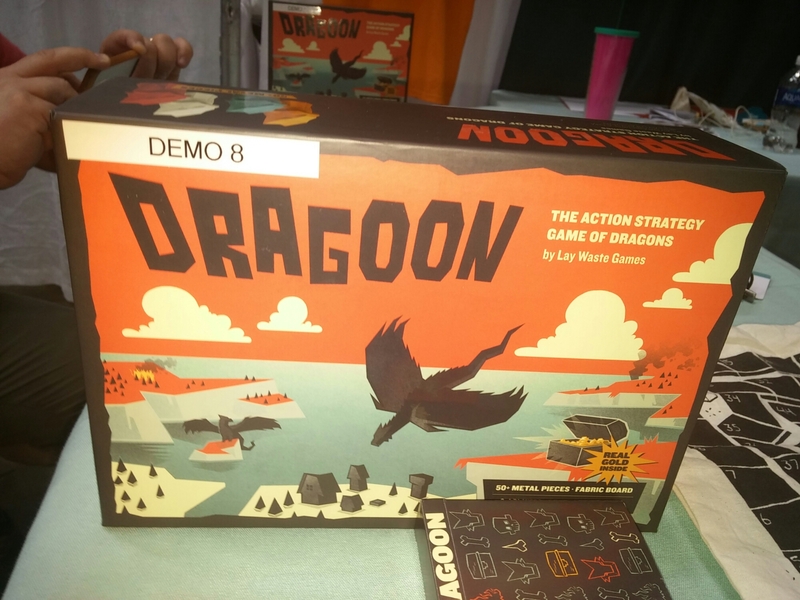 The first game we found was Dragoon by Lay Waste Games. This was a very interesting game that was simplistic yet confusing. First off, the components were on the far end of the spectrum. The bits were stellar. 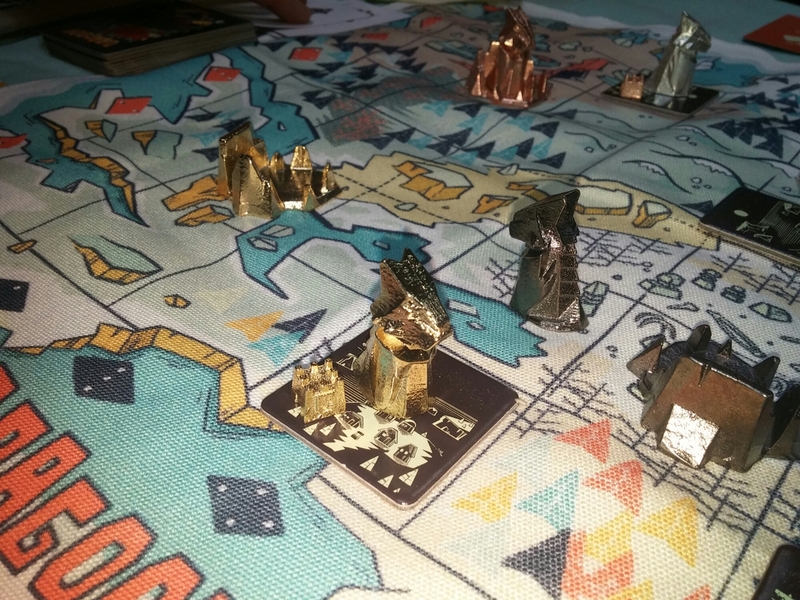 Your dragon, buildings, caves, scoring markers were all made of heavy metal and colored beautifully. The game just looked gorgeous on the table…..but then comes the boards. The main and scoring boards were made of cloth. 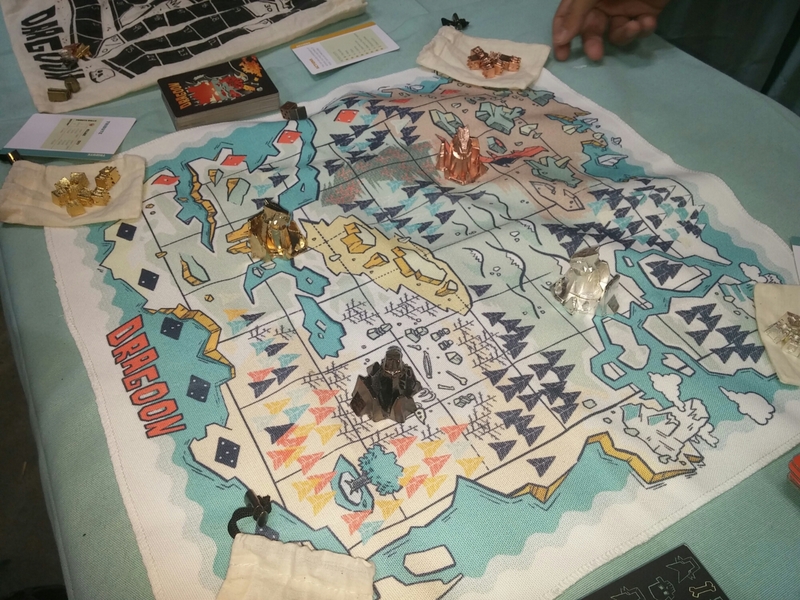 The cloth bag that the game comes in was the scoring board and then the main board can be rolled to be stored easily in the bag. In fact everything was stored in the bag which is a cool concept. 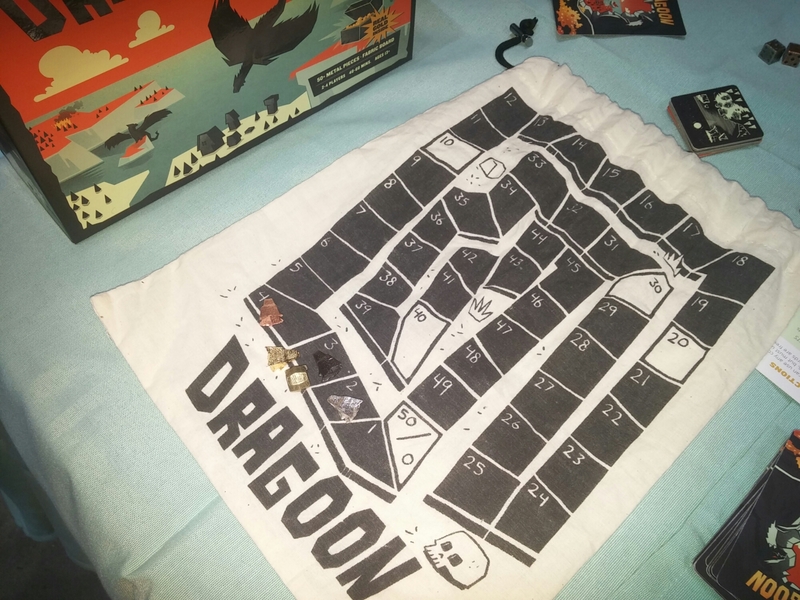 Dragoon is an area control game where each player controls a dragon flying around claiming towns or cities and causing terror on humans and trying to collect the most gold. The game is quite simple. 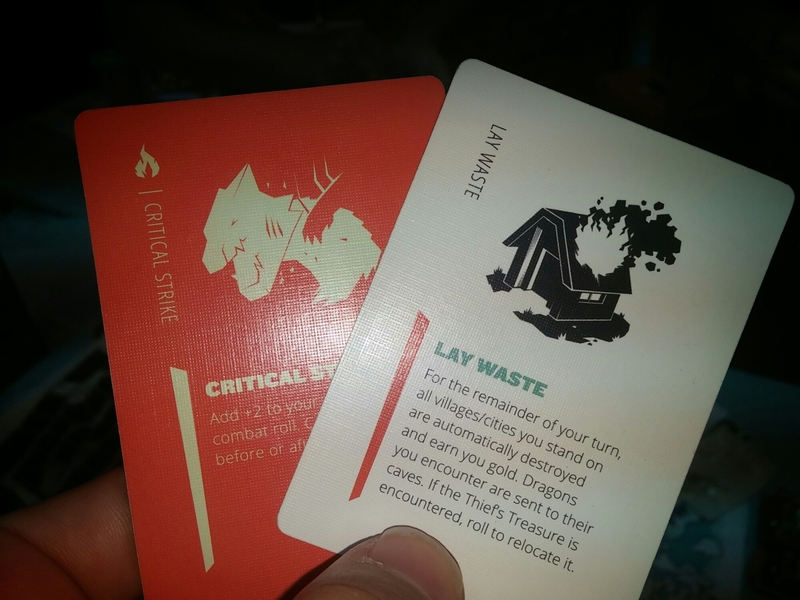 You have 3 actions to spend each turn and specific actions cost 1-2 points. You can play as many cards as you want for free. Your object is to gain the most gold. This is done by razing towns, controlling towns and finding treasure. At the beginning of each round you have to place new towns out on the board. The board is set up in a grid pattern, so you roll 2 dice and place the town where the two numbers meet. If a town is supposed to go where a town already is, the tile is flipped over revealing a city…..which gives you more gold. 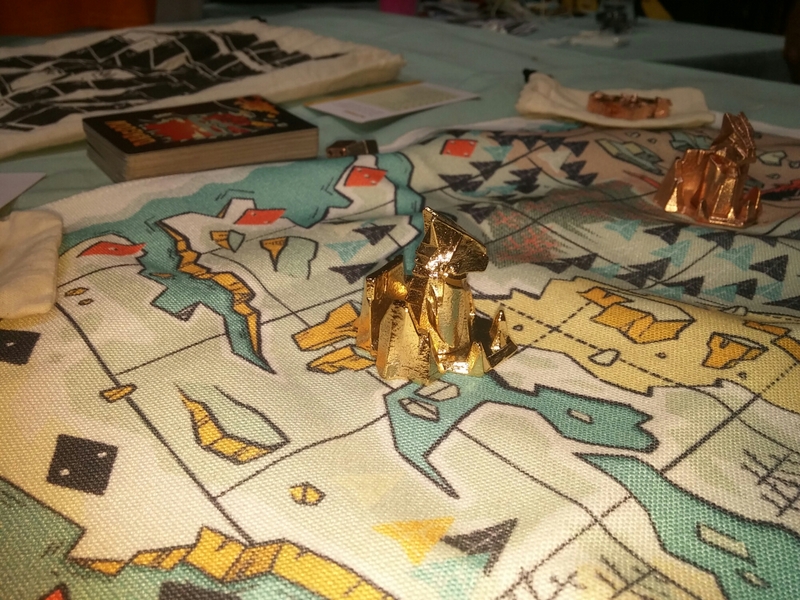 For every town you control at the end of each round you have the chance to gain gold based on a die roll. Like so many area control games it seemed most beneficial to go last in a round. All of the actions focus on gaining gold. Placing temples allows you to control the town, meaning the people of that town are now worshiping you. Razing a town only gives you one gold but could be a good way to get rid of a town your enemies control. There is combat in the game. Like the rest of the game, combat is simple. You roll a die and then if anyone has battle cards to play they play them one at a time and who ever has the highest result wins. The cards that you have and can play are cool. They give you many extra bonuses that can be very beneficial when played at the right time. Some allow you to claim a town next to one that you have already claimed. Another one allows you to fly back to your cave from anywhere on the board. They are a nice subtle touch that makes your strategy more easily handled. The confusing part comes in the price. When we got done playing our demo we asked how much it was and were taken aback on the price….$70! I am not saying that the miniatures are not worth it, but I struggle trying to find a reason why I would spend so much money on such a simple game just because the bits are excellent. In my opinion this game would have been great at a $25 price point with wooden or plastic bits. I probably would have come home with it. It is such a shame that a nice game like this was completely dismissed due to the price. The art is great, the game is smooth and it is just overall a solid and fun game!